An estimated 3,000 Islamic State fighters as well as militants from other extremist groups have fled Syria for Jordan fearing a renewed offensive by the Syrian army in addition to Russian airstrikes, a military official has told RIA news agency. “At least 3,000 militants from Islamic State (IS, formerly ISIS/ISIL), al-Nusra and Jaish al-Yarmouk have fled to Jordan. They are afraid of the Syrian army having stepped up activities on all fronts and of Russian airstrikes,” the RIA source said. The official added that on Sunday the Syrian army had carried out a number of attacks on Islamic State and al-Nusra fighters on the outskirts of Damascus as well as in the provinces of Deir ez-Zor and Homs. In Deir ez-Zor, 160 militants were killed in an army assault that aimed at driving extremists away from several settlements. In the province of Homs, the army destroyed two IS convoys near the city of Palmyra and 17 terrorists were reported killed in an artillery barrage. 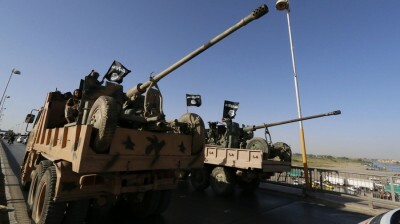 Syrian artillery also attacked several extremist groups, including al-Nusra, in the province of Homs where, according to the military source, a conflict between Syrian and foreign fighters erupted. Syrian militants insisted on retreating from a number of settlements fearing a large-scale offensive by the Syrian army and Russian airstrikes, while the foreigners refused to withdraw. Russia’s military operation in Syria has provoked a strong reaction from the terrorist groups, Syrian information minister Omran al-Zoubi has said, as cited by the Syrian TV. “Russian airstrikes have led to strong statements from terrorist groups and their backers. At the same time terrorist groups said nothing when the US-led coalition launched its operation,” he said. He also added that the US airstrikes against the IS are not effective as “the coalition wants terrorists to stay in Syria as long as possible”. Russia launched its military operation against IS and other terrorist groups at the request of the Syrian government on September 30. It has been carrying out airstrikes in close cooperation with the Syrian army to ensure the attacks are maximally effective.